Title: "I Sign Up, Basic Training and an Offer"
After graduating from John F. Hodge High School in St. James, in May, 1966, I enrolled at the University of Missouri-Rolla. Within three semesters, between the calculus classes, working too much, all-night card games, beer and girls, I was doomed. The pink slip came from the University: You’ve flunked out, don’t come back, good luck. Good-bye University, hello U.S. Army. At that time you could sign up for Army Rotary Wing Flight School with a high school diploma. You went through flight school as a Warrant Office Candidate, and if you made it and graduated you were made a Warrant Officer, given your silver Army Aviator wings and went to Vietnam. So, I signed up. Early on the morning of Wednesday, May 1,1968, Mom and Dad drove me to St. Louis in the family’s blue Falcon station wagon and dropped me off on the curb at the corner of 12th and Spruce Streets, which at the time was the Armed Forces Induction Center. I am sure the parents were as uneasy about seeing me off to the Army as I was about stepping into the massive Induction Center building. There were scores of recruits and draftees being processed, sorted, tested, prodded, examined, yelled at, classified, grouped, accepted, rejected and resorted that day (and every day during the Vietnam War). I had already passed my Class I Flight Physical, had been interviewed by a panel of Army officers and had passed the written exam. All this was part of my being admitted to Army Rotary Wing Flight School as a Warrant Officer Candidate. Later that day I was taken to Lambert Field. An hour or so later a TWA jet took off for Dallas Love Field, the first leg of my travels to Ft. Polk, LA and Basic Training. Ironically, I’d never flown in an airplane until that flight. My first flight was to go to flight school! From Dallas Love Field I flew on to Ft. Polk on Trans Texas Airlines, or “Tree Topper Airlines” as it was known, in a Douglas DC-3. (My first and only flight in the venerable DC-3.) I remember getting to Ft. Polk very late at night, then being bused to a big parking lot at our basic training company area. The parking lot had yellow lines painted on it. Some men were already there, standing on the yellow line, their bags laying on the asphalt next to them. We were instructed to put our toes on the yellow line and stand there and be quiet until our Drill Sergeants came for us. We lined up about midnight. The Drill Sergeants showed up about 5:00 am. About a hundred guys stood there all night, not saying a word. Welcome to the U.S. Army. Hurry up and wait! Basic Training is eight weeks long and has been endured by every person who went into the Army since George Washington. It is challenging in all respects: physically, mentally, emotionally and academically. The Drill Sergeants make life pretty much miserable for about 20 hours per day, 7 days a week for the whole 8 weeks. You are taught how to soldier, fight, use and clean weapons, administer first aid, camp, cook, polish boots and brass, etc., all the while being hazed by the Drill Sergeants and doing extensive amounts of physical training. It is really quite an ordeal. We lived in a big, wooden, two-story open-bay barracks building full of bunk beds with a foot locker for your stuff. The barracks had a communal toilet and shower facility. No privacy. In a strange way I sort of enjoyed Basic Training. I didn’t find it particularly difficult and even the hazing and harassment, to me, was not that bad. Hell, I’d been training for this all my life and didn’t know it. Pop, the taskmaster father had been on we kids for all of our lives. There was practically no pleasing Pop, just like the Drill Sergeants. Mom, while “softer” than Pop, likewise, enforced the strict family rules. I was accustomed to harassment and rules. And, Basic was just sort of an extension of my St. James Boy Scout Troop 95 experiences. I’d done all this Basic Training stuff in scouting. Camping, cooking, first aid, firing a weapon, keeping your proper uniform, map reading, physical exercise. Thanks to Scoutmaster Bruce Courtney and many great scouting trips and adventures, Basic Training was just “advanced” scouting. While in high school I had a job as one of the janitor’s helpers. I’d cleaned toilets, washed windows, mowed grass, cleaned, swept floors, mopped, washed dishes, painted and dumped trash cans for three years while in high school. And, three semesters of engineering college (albeit not with a stellar grade point!) prior to joining the Army helped. At the end of Basic Training in the overall ranking of our company of about a hundred men, I had scored the highest and was so recognized at graduation. While in Basic Training you fill out innumerable Army forms. They want to know all about you. Any special skills? Interests? Training? Knowledge? Sports? Talent? Speak any foreign languages? By sifting through the forms, perhaps the Army will actually match a trainee’s skill or prior training to some military need. (Well, OK, doubtful, but possible.) So, I filled out the forms (no special skills here) but when it came to musical instrument(s) played, I checked the flute. Hey, it didn’t ask “how well” you played! So I checked the box and went on and didn’t think anything about it. Late in Basic I was summoned to the Company Commander’s office. I reported and was introduced to an NCO (a higher-ranking enlisted man) in his very crisp uniform. He was with the Ft. Polk Army Band. 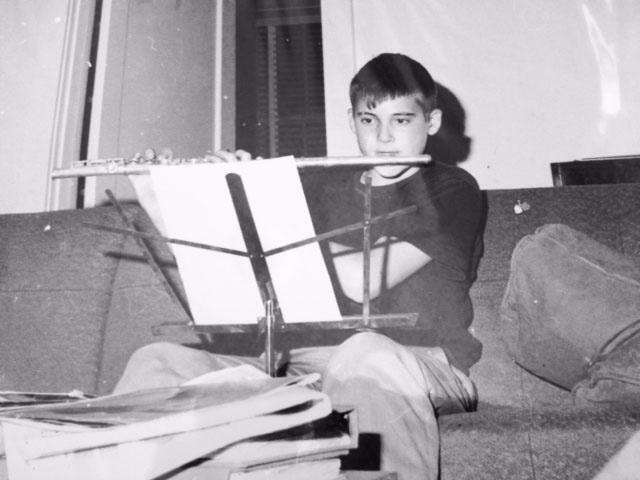 He looked me over and said, “Son, did you really play the flute in your high school band?” “Yes, Sergeant, I did.” He had an offer. They needed a flute player. If I was good enough I could spend my entire Army career right there in Ft. Polk, playing flute in the Ft. Polk Band, guaranteed! Well, let’s see. Spend a couple of boring, long years tooting out “Stars and Stripes Forever” at Ft. Polk (aka Ft. Puke), …or…become a U.S. Army Warrant Officer Helicopter Pilot, go to Vietnam to protect the free world from the spread of communism. Sorry, baton sergeant, you’ll have to find yourself another flautist. I declined. In the coming two years of flight school and Vietnam there were times when I sure wished I was playing the flute in the Ft. Polk Army Band!